Summer has begun in New England! Memorial Day weekend brought nice weather, later sunsets, farm-fresh produce, and, most importantly, regular ferry service to the islands. At this point, you’ve covered the big ones. Block Island. Martha’s Vineyard. Nantucket. Mount Desert Island. Now you’re thinking about the smaller ones. Shorter lines, fewer crowds, and empty beaches sound perfect this summer. So where to begin? 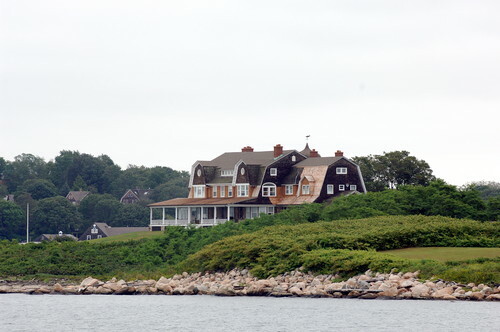 How about Fishers Island? Though technically part of Long Island, the nine-mile-long island looks, feels, and acts more like a New England island. The rocky island sits two miles off Connecticut’s southeastern coast across the Fishers Island Sound. It’s home to shingled, Cape Cod-style houses. It was once part of the Massachusetts Bay Colony and was raided by the British during the American Revolutionary War (many of the farmers fled to New England). Plus its ferries depart from New London, Connecticut. As you travel to the island, you breathe in salt air, listen to the seagulls overhead, and watch the shoreline slowly get smaller. By the time you arrive 45 minutes later, your pace and heartbeat have slowed. On the island’s west end, where the ferry docks, you find a small town that seems to just be waking up from a long winter. There’s a little museum, a couple of churches, and a few souvenir shops. A café is advertising steamers and scallops as specials. Plus an ice cream store welcomes dogs. Less than 250 people live here year round, but during the summer, that number swells to about 2,000. Outside of town, the houses quickly spread out and get bigger. There are two country clubs with golf courses and a yacht club that features races every Saturday. There are views of nearby smaller islands, including Wicopesset, Mason’s, and Elihu. But, most importantly, there are beaches. Nearly empty beaches. An eelgrass meadow boarders South Beach. Surfers bob in the water off windswept Isabella Beach. While artists search for the perfect view and lighting at Chocomount Beach. Take your pick. They’re all sunny. They’re all gorgeous. And they’re all nearly empty.